Peckam is the talk of the town. The Evening Standard and Time Out reckon it’s the new Shoreditch or the new Hoxton. In any case it’s trendy and if you’re hip this is the place to be. Of course, this can cause tension between those who live here because they love it as it is and those who see potential for change – some of it radical – to make it more Hoxton-like, more sanitised. So far, Rye Lane looks pretty much as it has done; still full of small independents, many selling food. 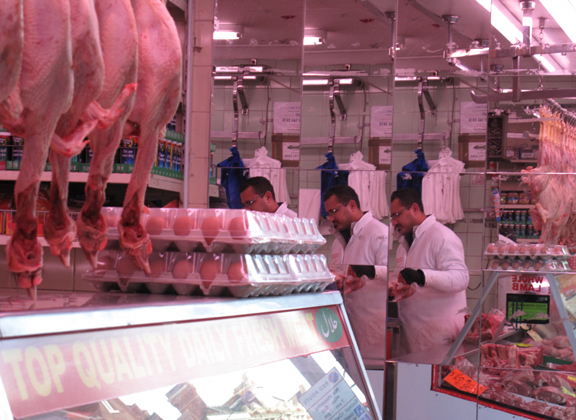 My pet-love is the butchers with their infinity of chickens. It’s done with mirrors. Admittedly, this picture shows only a suggestion of infinity because there has been a serious decline in the number of chickens displayed in all the shops. Something to do with food safety issues? On the other hand, the butcher comes as a set of three. This entry was posted in Peckham, Photography, Writing and tagged Butchers, infinity of chickens, Peckham, Peckham Peculiar, Rye Lane. Bookmark the permalink.